The German president Christan Wulff has been in trouble since mid-December 2011. He did not help his cause by sacking his spokesman without naming any reason on 22nd December. Before the sudden disappearance of Olaf Glaeseker, Christian Wulff had called him “my factotum” and even said “we are like Siamese twins” and "he is my alter ego". How embarrassing this must be for Wulff to be confronted with this news footage, after Olaf Glaeseker’s office was raided last Thursday, 19th January. He is suspected of corruption and bribery. 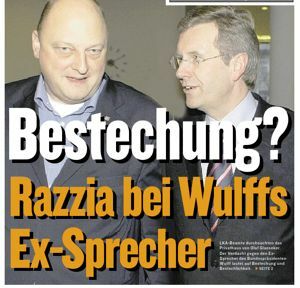 The offices of event manager Manfred Schmidt, who worked closely with the Wulff's office, when he was still Premier of Lower Saxony, were also searched. Both media reports and official investigations have led to suspicions that Glaeseker had improperly funded a series of conferences called "North-South Dialogue," which Schmidt had organized. The series took place between 2007 and 2009 and were sponsored by Wulff and then-Baden Württemberg Premier Günther Oettinger. In December SPIEGEL reported on allegations that Schmidt earned several hundred thousand Euros that had been provided by business sponsors at a single 2009 event. In return, it is thought that Schmidt made his holiday home available for free to Glaeseker and his wife for three vacations. At the time, Glaeseker was the government spokesman for Lower Saxony and, as a state official, was not allowed to accept such expensive gifts. 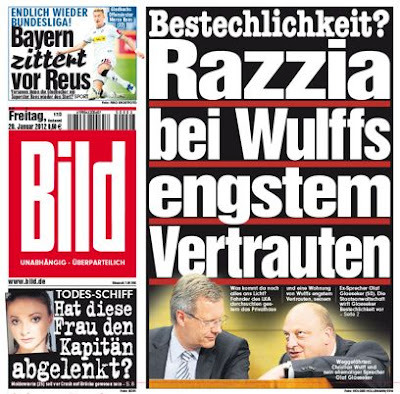 State prosecutors in Lower Saxony say that Wulff is not currently a target of any investigation. Meanwhile at Bellevue Palace, presently occupied by Christian Wulff, Prince Georg Friedrich of Prussia had been seen last Monday, 16th January. However, the hope that Wulff was preparing a hand-over of the highest office in Germany to the Hohenzollern Prince, are premature. Wulff isn't ready yet to resign. Instead His Imperial Highness, his wife, HIH Princess Sophie of Prussia and twenty other guests dined at Bellevue Palace. Christian Wulff had invited the heir to the German Crown because after last year's 950 anniversary of the House of Hohenzollern, Germany commemorates this year the 300th anniversary of the birth of King Frederik II of Prussia. Considering the scandals in which the republican head of Germany is involved, this is certainly a good time to reflect on the advantages of a Monarchy or have read that the Queen had to go to a TV studio to apologise for lies and mistakes? The politicians' president cannot shake of his political past which is plastered with helpful friends and financiers.